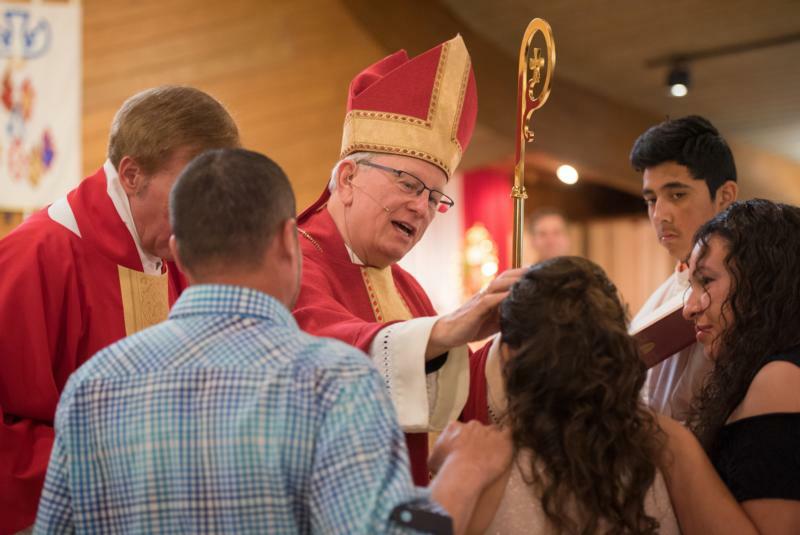 The sacrament of confirmation is perhaps the most mysterious of all the sacraments. Many Christians find it difficult to understand what benefit it brings. Isn’t the Holy Spirit received at baptism? Yes, baptism makes us “a member of Christ and a temple of the Holy Spirit” (Catechism of the Catholic Church, No. 1279). Then why do we need to receive the Holy Spirit again in confirmation? And, isn’t baptism “valid and efficacious” without confirmation? Yes (No. 1306). Then why do we say that “confirmation is necessary for the completion of baptismal grace” (No. 1285, 1288) or that it brings an “increase and deepening of baptismal grace” (No. 1303), its “strengthening” (No. 1289)? What do we mean when we say confirmation “perfects baptismal grace” (No. 1316)? Isn’t baptismal grace perfect enough? Of course, to answer the first question, all the sacraments are “actions of the Holy Spirit” (No. 1116) and all “‘sacramental grace’ is the grace of the Holy Spirit,” though in a way “proper to each sacrament” (No. 1129). So, the Holy Spirit is received in every sacrament, not just baptism, but in each in a different way. We can ask, What is the special relationship between confirmation and the Holy Spirit? What is the “action” of the Holy Spirit in baptism, and what is the action of the Holy Spirit in confirmation? To address the second question, baptism is valid and efficacious without the Eucharist also, and someone who dies immediately after baptism is saved without the help of any other sacrament. And yet we would not say that the Christian life on this earth attains its full exercise apart from the Eucharist. The Eucharist, too, completes baptismal grace, in the sense that baptismal grace is ordered toward the Eucharist. Baptism is the “gateway to life in the Spirit … and the door that gives access to the other sacraments” (No.1213); by baptism we are “born of water and the Spirit” (No. 1225, Jn 3:5), given freedom as “the children of God” (No. 1250). We are given “a share in the common priesthood of all believers” (No. 1268). This priesthood is exercised first in our participation in the Eucharist and in the eucharistic life it forms in us, as our whole life and all of our acts become more and more a living sacrifice of praise (Heb 13:15) in Christ and for Christ. This can help us understand the function of confirmation. Just as baptism is the sacrament of dying with Christ and rising with him to the new life of a child of God, and so is especially associated with the cross and resurrection, so confirmation is especially associated with Pentecost. In fact it is “the special outpouring of the Holy Spirit as once granted to the apostles on the day of Pentecost” (No. 1302). The Holy Spirit was poured out upon the apostles to strengthen them for their apostolic mission. Confirmation “perpetuates the grace of Pentecost in the church” (No. 1288). The sacrament thus has a unique connection to the apostles, and indeed the original rite of confirmation consisted of the apostles’ laying on of hands of the newly baptized, to strengthen them for their mission with the same special outpouring of the Spirit that they received. In baptism, the action of the Holy Spirit configures us to the passion, death and resurrection of Christ, bringing about our death to sin and our rebirth in the love and the life of Christ. We have a new identity as children of God. In confirmation, the action of the Holy Spirit is to strengthen us in our new identity, imparting an “apostolic” character. It associates us more fully with the apostolate, or the active mission of the church. It is baptismal grace itself that in a sense seeks its own maturity, its own growing up, its own perfection, just as the natural life of a child, in a sense, seeks its own maturity, completion, growing up. Baptismal grace precisely because it is a rebirth, is ordered toward the “growing up” and strengthening of the newly born in Christ. The action of the Holy Spirit in baptism orients us toward his own further action in conferring the further apostolic grace of Pentecost. Thus we are empowered to live out the eucharistic life toward which baptism, and indeed all of the other sacraments, are ordered, with a “Pentecost” identity, an identity analogous to that of an apostle. Thus baptism and confirmation are closely linked. Originally, confirmation immediately followed baptism, and it still does in the Eastern Catholic churches (and in the Latin Church for adult baptisms). But in both Eastern and Latin churches the connection with Pentecost was never left behind. In the Eastern churches, confirmation makes use of the special holy chrism blessed by the bishop, the successor of the apostles, while in the Latin Church, the ordinary minister of the sacrament is still the bishop. Because the bishop cannot be present at every baptism, the post-baptismal anointing of confirmation is delayed, but that should only serve to remind us that this sacrament is our participation in Pentecost, a privilege and fulfillment that our baptismal grace seeks and for which it makes us fit. Cavadini is professor of theology and director of the McGrath Institute for Church Life at the University of Notre Dame.